Hibiscus acetosella, commonly known as Maple Leaf Hibiscus is a tropical shrub and relatively little-known member of the hibiscus family which deserves more recognition. Under ideal conditions, plants can attain a height up to 8 feet. They prefer a moist soil in full sun or partial shade, but do not like 'wet feet'. We water ours every day during the hot summer months. They will let you know by curling their foilage when they are thirsty. Maple Leaf Hibiscus will do well year round where temperatures do not drop below freezing. Cut back all growth to about 24 inches from the ground after blooming ceases and temperatures start to get cooler. This will prepare them for the following season's onset of new growth and also serves to keep the plant compact and bushy. If you have forgotten to prune the plants or they have been damaged by frost, wait until the first signs of new growth in spring, then cut back all old and dead wood to within 20 to 24 inches from the base. They can also be grown from seed and treated as annuals in cooler climates. Of course, they will never attain their full potential in just one growing season. Alternatively, you can grow them in containers and let them overwinter in your garage or some other place out of the weather where they will receive some light. Don't forget to water enough to keep the soil from drying out, even though new growth may have stopped. 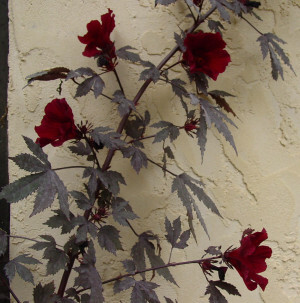 The most outstanding characteristic of the Maple Leaf Hibiscus is its distinctive maroon maple-shaped foliage which contrasts wonderfully with almost any other shrub or plant and makes a showy background when grown against a wall. If left to themselves, they are prone to get a little tall and leggy. If you lightly prune or pinch out the tips until the end of June, you will get a much bushier and more compact plant with many more flowers. Flowers appear in mid to late summer when plants begin their blooming cycle, producing flowers non-stop until the weather cools. The individual bloom is a velvety dark burgundy (nearly black) and opens in the morning, but lasts only one day, which is a common trait to most other plants in the hibiscus family. Maple Leaf Hibiscus is easily raised from seed, in fact you will find many volunteer seedlings pop up around a mature plant in spring. They may also easily be propagated by either soft or hardwood cuttings. Take about 6 to 8 inch tip cuttings and strip the lower leaves. Insert cuttings directly into pots containing average potting soil and keep moist. Rooting should take place in about 10 days when you will also see new growth beginning to show.